I have always loved the aroma and taste of coffee. 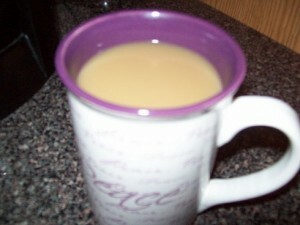 I’ve always liked it just black..no creamer and no sweetener. This year, I’ve been drinking tons of water every day to aid with weight loss. And of course, I’ve had a healthy bladder as a result too. So, a few weeks ago, I tried drinking coffee again. Hmmm…so far so good, no infection. I always drink water along with my breakfast and coffee in the mornings, and more water throughout the day. I’ve been drinking it black, just like above…no creamer and no sweetener. I went to the grocery store yesterday and needed to grab some coffee. I saw all the creamers and thought, hmm..I’ll try a couple of the flavored creamers. I tossed both the Caramel Macchiato and the Pumpkin Pie Spice in the cart. And of course the obvious bonus that goes along with drinking coffee…caffeine! It keeps me focused and more alert during the day.